Matt Warren bikes up Smuggler Mountain on September 19, 2017. The city’s Open Space and Trails board shared its future priorities with elected officials Tuesday, which are designed to complete several missing links outside of town and the surrounding valleys. “We are at an interesting time,” board member Charlie Eckart told members of Aspen City Council, adding there are a half-dozen legacy projects on the radar that are conceptual at this point. Board member Howie Mallory said the program has done a good job connecting trails through town but as growth pressures persist, west of Aspen is the next area of concentration. “We haven’t done much planning out there,” he said. But the first priority could likely be inside of the roundabout. They are calling it the Hunter Creek Access Trail, which would provide a better connection for mountain bikers to the trails on and around Smuggler Mountain. It would be built on the east side, near the Centennial housing complex and branch off of the Lani White Trail. Currently, bikers have to slog up either Red Mountain or Smuggler roads to get to the single-track. A new route along the west side of Maroon Creek Road also is being planned, so cyclists and pedestrians aren’t forced through the Aspen public school campus from the existing trail on the east side. Eckart noted that the current trail is heavily used and woefully inadequate. The new Maroon Creek Trail would start at the kiss-and-ride area by the roundabout and go to the Aspen Recreation Center. Another connection the board wants is known as the South Side 82 Trail, of which the alignment would be on the south side and go from Buttermilk over a redesigned historic Maroon Creek Bridge to the roundabout. It would eliminate having to cross Highway 82 at the Buttermilk stoplight where there is a paved trail. Connecting the Intercept Lot to the Aspen Business Center also is a key trail, which would offer a safer route for commuters and users of Sky Mountain Park. Also on the list is the already-in-development Castle Creek trail that will connect the music school campus to the Marolt housing complex and path into town. 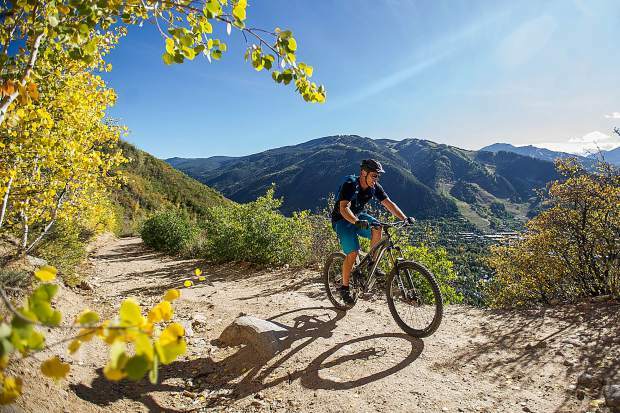 The city’s open space program is partnering with Pitkin County on that project, along with other entities that benefit from the trail. The city’s open space program is funded through a 1.5 percent sales tax. Voters in 1970 approved a 1 percent parks and open space tax, which allowed the city to establish a foundation of open space and trails. In 2001, the community passed a 0.5 percent sales tax, which is specifically dedicated to acquiring and maintaining open space, as well as developing trails and recreational facilities. The ballot measure authorized $38 million in bonding capability. The Open Space and Trails board was established a year before that tax passed. And for the past 18 years it’s been pretty busy. The program has preserved 1,662 acres through property purchases, buying conservation easements, donations and development negotiations. Of that bonding capacity, $4.4 million is left. This year’s budget for the program is nearly $777,000 for open space management and trails maintenance, according to Ben Sachdeva, the city’s financial analyst for the Parks and Recreation Department. In the past 11 years, trail development has been a priority for the board. The city’s trail system consists of 36 miles, nearly 28 of which have been added in less than two decades. “Our Open Space and Trails network is a jewel of this community and an envy of other communities,” Mayor Steve Skadron said. Councilwoman Ann Mullins said she anticipates land grabs in the future as groups eye open space for other purposes such as affordable-housing development. The board will need to become protectors, along with being stewards of dedicated open space. “I think we are going to have to defend it,” Mullins said, adding that a “more active dialogue about open space’s” intrinsic value will need to happen. Councilman Adam Frisch said he doesn’t believe the community’s values will change on dedicated open space. Eckart pointed out that political winds can change over decades and a new generation may value the land differently in the future. City Attorney Jim True said city government does have the ability to condemn property or send a question to the voters to change the use of open space. “Open space is like storage; you don’t use it until you need it for a higher and better use,” he said.